This is a perfect package for couples wanting a midweek getaway. We have combined two interests to be shared together or separately. Your choice! 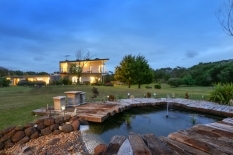 Harmony B&B is a traditional bed and breakfast set within five acres of rural gardens at Fingal for those wishing to escape to the Mornington Peninsula. Bay Fish N Trips’ vessel Plover is the perfect platform for fishing or cruising on Port Phillip Bay, departing from Mornington. Start the day with a morning fishing trip on board the Plover from the Mornington Pier. Following your marine adventure on Port Phillip Bay continue onto your accommodation at Harmony B&B. Then soak away your cares at the Peninsula Hot Springs. Commute together to the Mornington Peninsula but drop your partner off at the Mornington Pier for a five hour fishing trip before continuing on your own to the Harmony B&B. Once you have checked in, continue onto the Peninsula Hot Springs. These packages are available midweek (Mon through Thur nights only). Call Sandra, Bay Fish N Trips on 0418 349 364 or Sharon, Harmony B&B website on 03 5788 6375 to book your package. NB. Subject to availability. Valid until the 20th Dec 2017. Fishing trip is weather dependent - if cancelled due to inclement weather, money for the trip will be refunded and suggestions made for an alternative activity. Package is valid for Shared Fishing Trips. Not available on Public Holidays.